DALLAS -- John Will Fritz, who headed the Dallas police inquiry into the assassination of President John F. Kennedy, died Thursday following a brief illness. He was 87. Fritz, who retired in 1970, was known nationally for his prowess as an investigator of violent crimes and as an expert interrogator. His best known investigation, however, never came to trial. He headed the inquiry into the Nov. 22, 1963, assassination of Kennedy and interrogated suspect Lee Harvey Oswald. Oswald was gunned down by nightclub owner Jack Ruby as police escorted him through a parking garage two days after his arrest. 'That particularly hurt him, because he had built a great case against him,' said Dallas County Sheriff's Capt. Gus Rose, who worked on Fritz's staff for nine years. 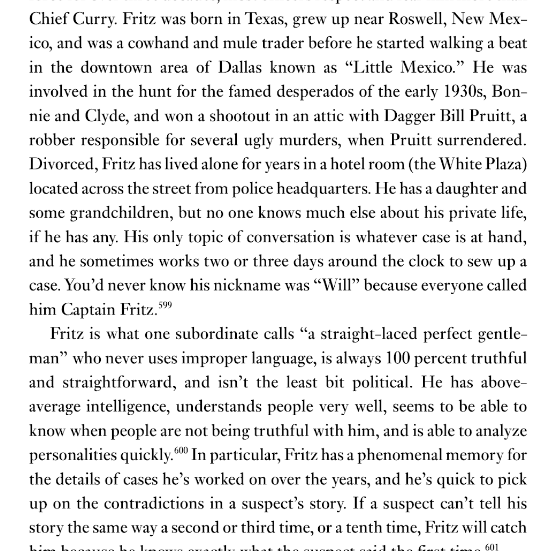 Fritz was born June 15, 1896, in Dublin, Texas, and was raised on his parents' ranch in New Mexico. He served a brief stint in the Army during World War I and joined the Dallas police in 1921 as a beat officer. 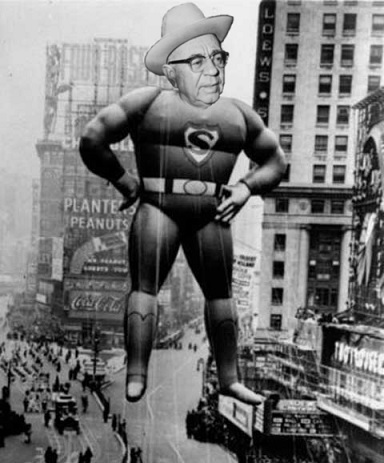 By 1934, he had risen to captain and was organizing the department's robbery-homicide division. He retired in 1970 after 49 years' service. 'He was the best, the very best of his kind,' said retired Texas Ranger Capt. Jay Banks, who worked with Fritz on numerous cases. Funeral was set for 4 p.m. CST Monday at Restland Funeral Home in Dallas. Survivors include his wife, Faye; a daughter, a brother, six grandchildren and one great-grandchild. Vinny wrote: Fritz, who retired in 1970, was known nationally for his prowess as an investigator of violent crimes and as an expert interrogator. Nice to start off the day with a good laugh. Can any one help me with any info on Fritz....books or bio's of those he was connected with...especially his private life. I've read somewhere he lived alone, that he had two wives at different times in his life and daughter, first wife's name was Dorothy I think ...I've also read he lived across the road from City Hall in a hotel for a time....not sure. there is a bio - but be warned. It celebrates Fritz as a hero. That said, any background in it on marriages and addresses is likely to be accurate. 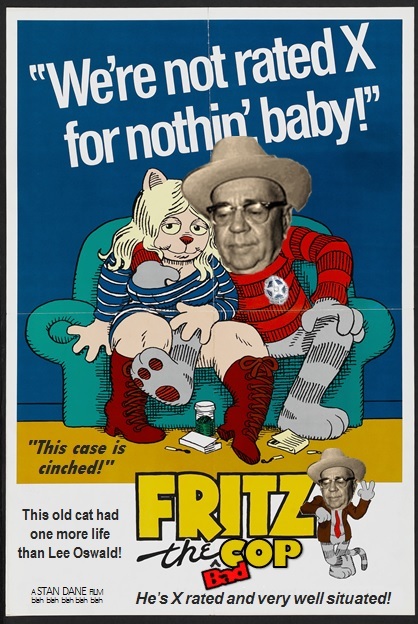 Fritz's wife died in 2012. His daughter in 2016 or 2017. He used to live in a hotel room opposite the city hall. He declined interviews about the case. That's the bio I was referring to. Read what the author says. He is a Fritz fanboy. He has a similar book on Decker. Thanks Vinny. That is very interesting that one of the two people arrested for the murder of Fritz's father was Ray Hamilton of Bonnie and Clyde fame and cousin to Helen Markham (in fact, Helen was raised as his sister). Also interesting that Decker was the one who finally arrested Hamilton who get the electric chair on other matters. Decker then went about getting Ray's brother FLoyd pardoned and set him up with a security job with Mr Bankston who was known to be a liaison with local buyers of stolen property --- the very type of property that Helen's son James was involved in obtaining from break and enters. Curious still that James was on parole and that Hamilton started taking young parolees under his wing - allegedly to stop them re-offending. 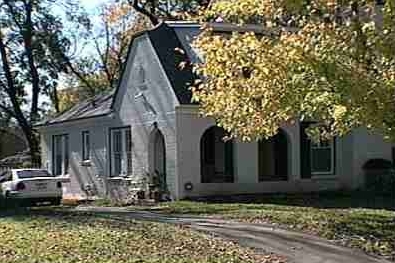 A photo of Fritz's house. Thanks Greg, seen both. Reviews on Amazon are sickening too. You couldn't make this stuff up. Look at the connections. Vinny wrote: A photo of Fritz's house. Vinny do you know what era of Fritz' life this photo is from? Do you know when he lived across the road from City Hall in the hotel? Is this house in Dallas Texas that you know? Thanks Vinny. Which book is this excerpt from? 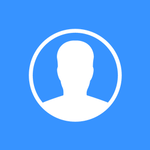 Close friends with Clint Murchison? On November 22, 1963, shortly after the Kennedy Assassination, Captain Will Fritz and his homicide detectives responded to the 6th floor of the Texas School Book Depository in downtown Dallas. Of course, this was the scene of Lee Harvey Oswald's improvised sniper hide overlooking Elm St., Dealey Plaza, the Triple Underpass, and the infamous "Grassy Knoll." 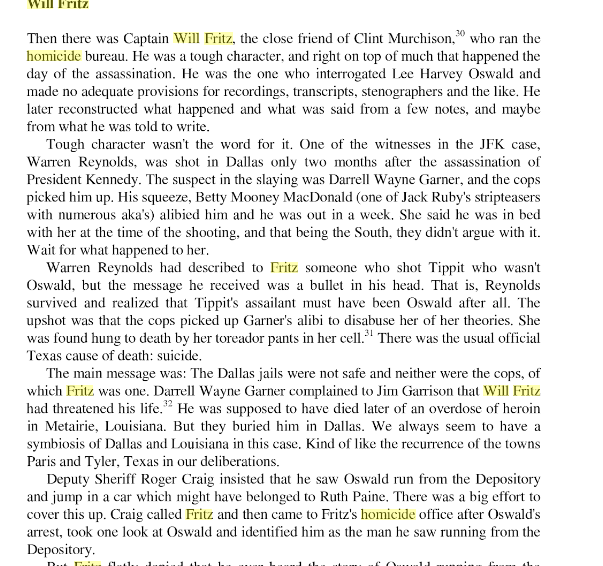 Captain Fritz, a seasoned interrogator, was the first to question the suspect who was subsequently charged with the murders of President Kennedy and Dallas Police Officer J.D. Tippit. Promoted through the ranks, Fritz organized the Homicide and Robbery Bureau in the early '30's. Over many years he had various temporary titles, but "Captain Fritz" is the one that endured! Fritz had a uniquely personal retrospective on law enforcement. Still on the job in early 1970, the Captain had already achieved veteran status at the onset of the Depression gangster era. Before the days of formal criminal justice programs and regular in-service training, detectives received basic guidance from experienced personnel. Beyond what was often very elementary instruction, the best were largely self-educated as to the fine points of criminal investigation. So it was with Will Fritz. Since little is known about his life outside the DPD, some might assume it was rather unremarkable. However, the most plausible explanation is the department was his life for a half-century (and probably had significant influence on his retirement years, since he lived across the street from headquarters). The Thompson SMG was likely acquired by Fritz after his promotions, either to the rank of lieutenant or captain. He kept the gun, magazines, ammunition and fitted case in his office closet. Only one documented instance of the Thompson being fired in an official capacity is available. While there may have been other such incidents, they are likely lost to history. James R. Leavelle, DPD badge No. 736, is a retired homicide and robbery detective who worked under Captain Fritz for years. While doing research for a book (not connected with this article), retired DPD Captain E.
R. Walt interviewed Jim Leavelle. When Walt asked if he knew anything about the Thompson, Leavelle replied, "Hell! I saw it in action once!" 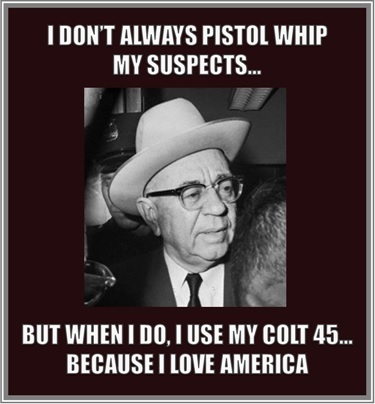 On May 25, 1959, a deranged gunman barricaded himself and several hostages in a frame house located in a residential area 10 miles southwest of downtown Dallas after previously killing one person. Jim Leavelle recalled detectives at the scene armed with Remington Model 81 semi-automatic rifles, their suit coat pockets bulging with ammunition. Captain Fritz showed up carrying his Thompson, complete with the drum magazine. The crazed suspect fired a high-powered rifle as officers attempted to gain control of the situation. While Leavelle kicked a hole in a door, Fritz opened up with the Thompson, lacing a neat row of bullet holes waist-high in the wooden structure. Although the autopsy showed the deceased was struck by bullets from various police firearms (possibly including the Thompson), the report revealed the cause of death to be from a self-inflicted .38 caliber gunshot wound to the heart. No hostage was injured. Today, retired Detective Leavelle and his wife reside in a suburb near Dallas. He enjoys good health and his mind remains sharp, remembering minute details of numerous incidents that occurred decades ago. Jim's seen more than a few Sundays pass in his 94 years, but two such days stand out among the rest. The first was December 7, 1941. As a young sailor stationed at Pearl Harbor, he witnessed the devastating Japanese attack. The other significant Sunday was more than 20 years later, November 24, 1963. Leavelle was handcuffed to Lee Harvey Oswald as officers prepared to transport Oswald from the Dallas City Jail to the Dallas County Jail when Jack Ruby shot Oswald in the basement of DPD headquarters. Captain Fritz, overseeing the prisoner transfer, was only a few steps away. Those who have studied the Kennedy assassination and its aftermath are familiar with Detective Leavelle and his role in the investigation. The distinctive light-colored hat and matching suit he wore that day, along with his handcuffs, are on display in the Sixth Floor Museum. As a matter of record, Jim Leavelle stands by the facts of the entire investigation, subscribing to none of the conspiracy/crackpot theories for which there has never been evidence. For a time after his retirement, Will Fritz lived in the old White Plaza Hotel in downtown Dallas. This was just across the street from 106 South Harwood St., Dallas Police Headquarters from the early 1900's until a new facility was completed several years ago. Fritz was a regular patron of the street-level restaurant in the hotel. Since many of his former co-workers and subordinates also frequented the eatery, the old lawman probably felt comfortable there. Fritz died in 1984 at age 89 A request to photograph the Thompson during a live-firing event at the DPD Firearms Training Center was denied. The "Fritz gun," as I've come to refer to DPD No. 13, will never be fired again. However, its showcasing in the museum will be an appropriate tribute to the memory of Captain Will Fritz and a legendary era in law enforcement. So Fritz lived in this home in or around 1932? That's right,Mick. Also it was the house he stayed in during the time of the Bonnie and Clyde case. As for the hotel, there seems to be conflicting information. Some sources say he lived there after he retired. Others claim he lived there while still with the DPD. That he wanted to live close to Police HQ just in case there might be an emergency and his services were needed. Living close to the station would mean that he could get there quickly. He was a workaholic. The hotel Fritz stayed in. From Four Days In November. Gatewood, Jim. Captain Will Fritz and the Dallas Mafia . Mullaney Corporation. Kindle Edition. Vinny wrote: That's right,Mick. Also it was the house he stayed in during the time of the Bonnie and Clyde case. Just trying to get my head around the timeline here. Would this have been the family home where Mum and Dad possibly lived? Or is it Fritz and his first wife's house? Boilermate III - Working ok until thermostat kicks in and top leds start pulsing ?